National Trail’s Travis Hunt applies pressure on Eaton’s James Howard during a boys basketball game on Saturday, Feb. 2. The Blazers held off Eaton for a 67-58 win. National Trail’s Cameron Harrison puts up a shot against Eaton on Saturday, Feb. 2. Harrison scored 25 points to lead the Blazers to a 67-58 win. 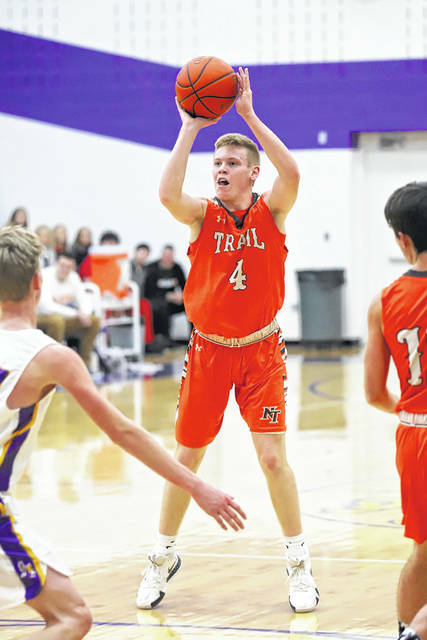 NEW PARIS — National Trail’s boys’ basketball team continues to roll, picking up two more wins this past weekend. The Blazers are now 15-2 overall, 7-2 in the Cross County Conference. NT opened the weekend with a win over Tri-Village, 58-38, on Friday, Feb. 1. The Blazers built an early led on the Patriots, taking a 17-11 advantage into the second quarter and a 10-point lead at halftime. NT opened the second half with a 15-4 run to take full control of the game. National Trail secured the win despite not shooting particularly well, according to coach Mike Harrison. Travis Hunt and Cameron Harrison each had 12 points and five assists and Zach Woodall had 12 points and seven rebounds. On Saturday, the Blazers defeated host Eaton, 67-58, in a non-CCC match up. While NT led most of the game, they were not able to extend their advantage as Eaton kept the game within reach. NT led by eight at halftime, and just four going into the fourth quarter. Harrison scored 25 points and had five assists. Hunter Michael added 14 points and pulled down eight rebounds. Travis Hunt added 12 points and Zach Woodall had 10 points and nine rebounds. The Blazers, winners of 10 straight, were scheduled to play at Newton on Tuesday, Feb. 5 and will host Mississinawa Valley on Friday. 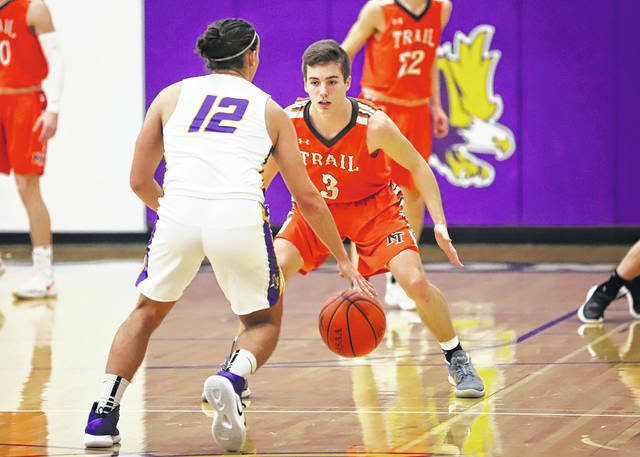 https://www.registerherald.com/wp-content/uploads/sites/41/2019/02/web1_EHS-NT-5.jpgNational Trail’s Travis Hunt applies pressure on Eaton’s James Howard during a boys basketball game on Saturday, Feb. 2. The Blazers held off Eaton for a 67-58 win. https://www.registerherald.com/wp-content/uploads/sites/41/2019/02/web1_EHS-NT-6.jpgNational Trail’s Cameron Harrison puts up a shot against Eaton on Saturday, Feb. 2. Harrison scored 25 points to lead the Blazers to a 67-58 win.